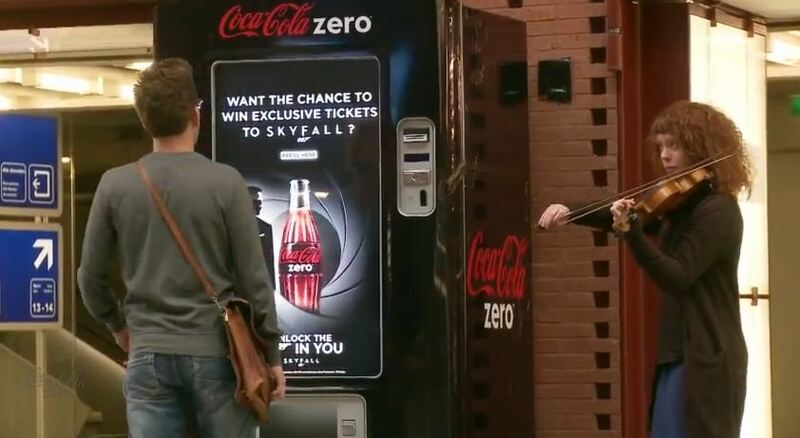 In a cross-promotion for the upcoming James Bond movie, “Skyfall,” a Coke Zero vending machine sends passengers at the train station Antwerpen Centraal in Antwerp, Belgium, on a mission to become James Bond for the chance to win tickets to the movie. After purchasing a Coke product, stantion passengers are then asked to enter their name and then instructed they have 70 seconds to reach another point on a different platform within the train station. As the new participant decides “why not?” and takes off to reach the end point, they discover it is not as easy as going up a couple flights of escalators. Upon reaching the required destination, the new “James Bonds” find out there is one last piece to their mission they must complete in order to win tickets to the movie. Below are two videos, the first shows those that succeed in their mission. The second are the 007 “FAIL’s”. I’ve seen other fun public stuff like this before, and they are almost always not in the US. I wish they would do stuff like this here in the states. The companies, like Coca-Cola in this case, are probably afraid of American suing them if they don’t win. Behind the scenes – Unlock the 007 in you. You have 70 seconds! If Craig himself were there, I’d race you! You’re not kidding. When I saw him in the first Bond movie he was in, I fell deeply in lust. I love this! Thanks so much for digging this up; I love Bond and Coke!